OK guys, we need to talk about fudge. Why you ask? Because it is so delicious that I can’t believe there’s not a recipe for it on The Usual Saucepans already. 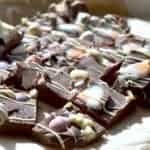 This Easter chocolate fudge is pretty much all you will need in your life this Easter – seriously, step away from the Easter eggs and chocolate bunnies, and get yourself a square of this joyousness. Am I over-egging (see what I did there? So not even sorry) this recipe? No, I don’t think so. I made some to take into the office last week and after several thoughts on how good we’d all be and not have any until mid morning, the resolve cracked (again, not sorry) about 9.05. Can you see why? There is a lot of deliciousness in this recipe and it’s got the added benefit of looking pretty darn impressive whilst also being ridiculously simple to make. Don’t believe me? Well, the ‘hands on’ time of this is pretty much as long as it takes you to melt chocolate and do a bit of whisking. That’s really about it, you get the fridge to do the rest. 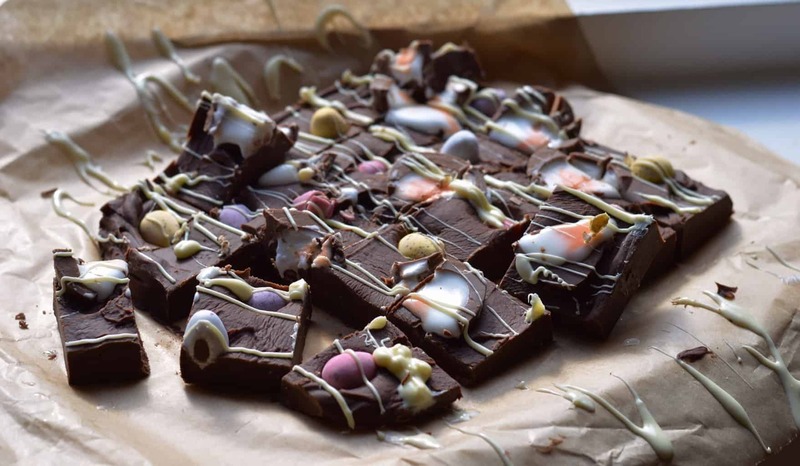 Whether you are looking for something to take to work, to a party or package up as little Easter gifts, this eggcellent Easter chocolate fudge is a winner in almost every situation. This is based on a easy fudge recipe I’ve been using for years and taking a bit of inspiration from what I’ve seen other people making on Instagram. I like adding in a little vanilla to make it eggstra delicious, but the eggact amount of Easter treats in it is up to you, depending on just how much too much sugar you want in your life. It takes about 15 minutes to make, and sets overnight in the fridge. Makes about 25 squares. Put a pan of water on the hob to simmer and put a pyrex (or similar) bowl on top, making sure the water does not touch the bottom. Break the dark and white chocolate into this and allow it to melt. Once the chocolate has melted, pour in the condensed milk and gently mix together until fully combined. Take off the pan of water and let it settle for a minute of so. Add the vanilla and sieve in the icing sugar (this removes any lumps) and then whisk into the fudge mix, it will be quite thick at this point. Pour into a deep tray lined with greaseproof paper and smooth the surface out. It should be about 2-3 cm deep. Chop your creme eggs into quarters and press them into the mixture, fondant side up. In between the creme eggs, press mini eggs into the mix at various depths. Put into the fridge and set for at least three hours, but ideally over night. The next day boil the kettle and fill a mug three-quarters full. Put your Milkybar (or similar) into the mug still in its wrapper. This will melt it and also act like a piping bag, without the extra faffing about. Once melted, cut off a corner of the wrapper and squeeze gently whilst going back and forth over your fudge to decorate the top. Slice into squares (about 25 in my case, each about 3 cm square) and serve.